C.J. 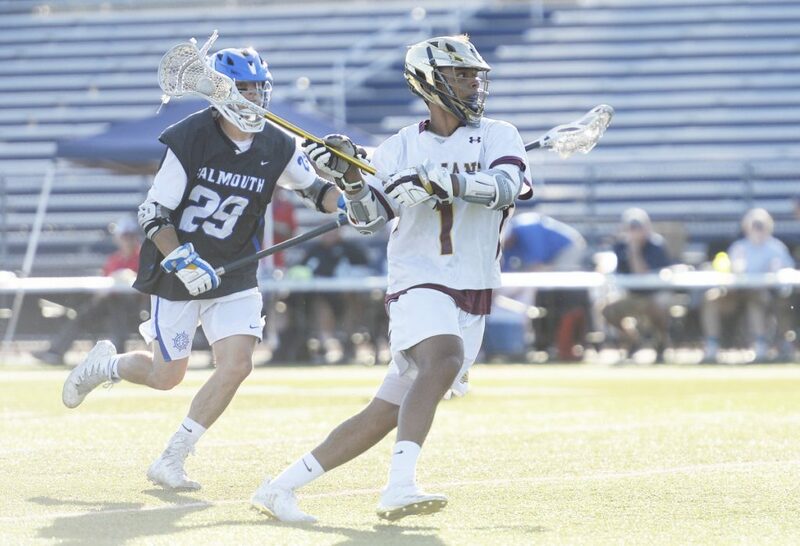 LaBreck went into his junior lacrosse season knowing Thornton Academy could win its first Class A championship – especially if he improved on a good-but-not-spectacular sophomore season. “It was just a buildup of a little more confidence, and I knew we would have a great team and I knew if we were ever in a little slump, I could be the one to pick them up,” LaBreck said. Two instances stand out when LaBreck grabbed hold of a game and led Thornton to a win. Early in the season, powerful Cape Elizabeth led the Trojans 8-5 in the fourth quarter. LaBreck scored four straight goals in 21/2 minutes, and Thornton won in overtime, proving it was ready to compete with the top teams in the state. Then, in the state championship game, Falmouth led the unbeaten Trojans after one quarter, 5-2. Twice in the first 1:01 of the second, LaBreck scored one-on-one goals against Falmouth’s two-time All-State long-stick midfielder, Riley Reed. In the fourth quarter, with Thornton still down a goal, LaBreck scored three straight goals, propelling Thornton to a 14-12 win. LaBreck made a preseason list of goals: Be chosen for the U.S. Lacrosse Maine All-America team, earn first-team SMAA honors, raise his assist total, help Thornton win the state title and become a better teammate. LaBreck’s 44-goal, 34-assist season netted another honor: the 2018 Maine Sunday Telegram boys’ lacrosse Player of the Year. LaBreck was essential in Thornton’s ability to move the ball from defense to offense. “He’s a complete player, absolutely,” said Falmouth Coach Dave Barton. A three-sport athlete, the 6-foot-1, 200-pound LaBreck loves working out and getting stronger. He thought of himself as a football-first guy until this past winter. Shortly after the championship win, LaBreck made a verbal commitment to play lacrosse at Monmouth University, an NCAA Division I program in West Long Branch, New Jersey.